Julie also tweeted a pic of her hands holding "Big Brother" cards in which her wedding ring was visible. 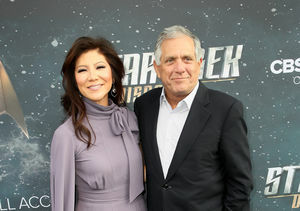 Over the weekend, Moonves stepped down as the CEO and chairman of CBS as the result of sexual assault allegations, which he has cited as “untrue.” In his own statement, Moonves said, “For the past 24 years it has been an incredible privilege to lead CBS's renaissance and transformation into a leading global media company… Untrue allegations from decades ago are now being made against me that are not consistent with who I am. I am deeply saddened to be leaving the company. I wish nothing but the best for the organization, the newly comprised board of directors and all of its employees."